Pink, crusty eyes are a sign of infection. If you wear contacts and have an eye infection, you need to immediately remove your contacts and give your eyes a chance to heal. Eye infections can be serious and can cause long term vision problems. Serious eye infections require treatment or attention from your eye doctor. Contact your eye doctor immediately if you have any concerns. Just like other parts of the body the eye and the tissues around it can become infected. These infections can be caused by bacteria, virus, parasites, fungi or other irritants. Some conditions like conjunctivitis or pink eye can even be caused by allergies. Eye infections can be minor and may resolve themselves or can be more serious requiring medical attention. Very serious infections can lead to loss of vision and other long term vision problems. Eye infections are potentially serious and may need immediate care. Signs of an infection include pain in the eye, pinkness or redness, discharge, light sensitivity, blurry vision or a foreign body sensation like feeling there something is in the eye. Serious infections often need medical attention so you may want to contact your eye doctor. Infections can have many causes. 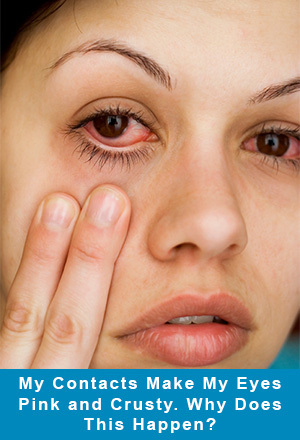 Sometimes the eye is irritated by a foreign substance or an infection occurs after a scratch or injury to the eye. Infections can also be caused by viruses or bacteria. While eye infections are serious for all people, they can be especially severe in those that wear contact lenses. Infections also tend to be more common in contact lens wearers. This may be due to improper cleaning or sanitation of the lenses or from increased irritation by wearing contacts. If you have frequent eye infections, talk with your eye doctor as they may be able to help you find and correct the problem. Contact lenses can hold bacteria, viruses and parasites against the eye giving them an increased opportunity to irritate the eye and cause problems. It is important to remove your contact lenses as soon as you think you may have an eye infection and contact your eye care provider to see medical attention. Taking care of your contact lenses is an important way to avoid some eye infections. Proper cleaning is essential for keeping your eyes healthy and for helping your contacts to last as long as possible. Whenever you handle your contact lenses make sure you wash your hands thoroughly with soap. Keeping your hands clean will help keep bacteria from transferring to your lenses. Dry your hands using a clean towel, not by wiping them on your clothing. Also keep your lens case clean and replace it often, at least every three months. Each time your contacts are removed your lens case should be cleaned either using contact solution or hot water. When cleaning contact lenses only use approved contact lens cleaners. Plain water can have bacteria or parasites in it and can potentially cause an infection. You should never clean your lenses with saliva. Your saliva is full of bacteria that can be transferred into your eyes. Follow the instructions listed on your specific lens cleaner. Your eye doctor can help you choose a good contact lens cleaner for your specific type of lenses. In addition to properly cleaning your contact lenses, avoid sharing your contacts with others or using lenses that aren’t specifically fitted to your eye. Avoid wearing contacts swimming or in the shower and always remove your contact lenses at night unless you have lenses specifically designed for overnight use. There are many different types of eye infections and each will have different recommendations for care and treatment. In general you will want to remove your contact lenses if you have signs of an eye infection. Avoid wearing them until the eye is completely healed. Clean your hands often when you have an eye infection and avoid touching the infected area as much as possible. If your eye is pink and crusty, you probably have an eye infection. Give your eyes a chance to heal by using glasses for a few days and don’t hesitate to contact your doctor if you have any concerns. Eye infections have the potential to be very serious. Do you experience pink and crusty eyes frequently? Comment below!